Happy hump day, dear readers! This week seems to be flying by, and I'll be heading down to the Los Angeles area for The Indie Shop this weekend! I thoroughly enjoyed myself when I attended in May, so I am thrilled to be going back this fall. I'll be sharing photo during the event on social media so make sure you're following along! Now on to today's post! November 2nd officially marks the end of the Mexican festival celebrating loves ones that have passed. Starting on All Hallows Eve, or Halloween as many are familiar with, Dia de los Muertos combines Aztec ritual with Catholicism. The festival is celebrated in my little town throughout the month of October with the painting of sugar skulls and a traditional dance troupe. It all comes to a close a candlelit procession through out town center, and it is such an amazing experience. I've been wanting to do Dia de los Muertos inspired nails for quite some time, and I decided it needed to happen today! Let's get to it! Born Pretty Store arrived, and a few pieces caught my attention. How pretty are these vinyl stencils! Not only in the pattern itself beautiful, the sticker itself is a glorious golden holographic pattern! I also received this plate, and while I orignally had something else very different in mind to do with this, it worked out perfectly for me! I know, I know, you're thinking "Jen, you DO know you're supposed to be doing nail art for Dia de los Muertos, right?" I know my husband certainly raised an eyebrow when I first set out to create my design. Haha! Let's check out what I came up with! I apparently was in an outside the box type mood when I created these nails! While marigolds are traditionally associated with Day of the Dead, I couldn't shake my love of roses with skulls. 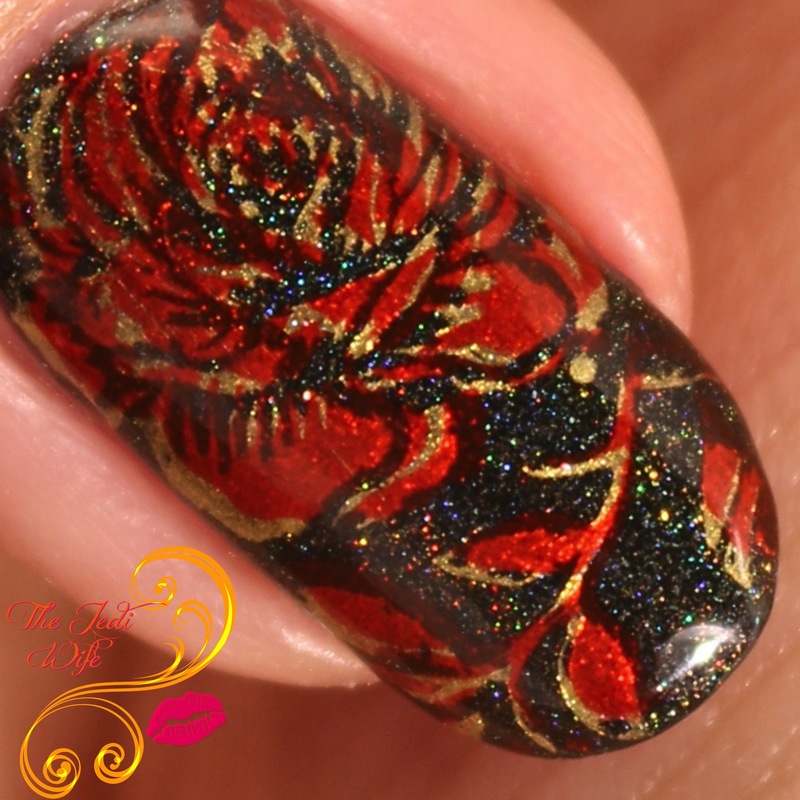 It should be obvious where the rose pattern came from- it was hiding out on my stamping plate! The vinyl stencil sheet can be found here. 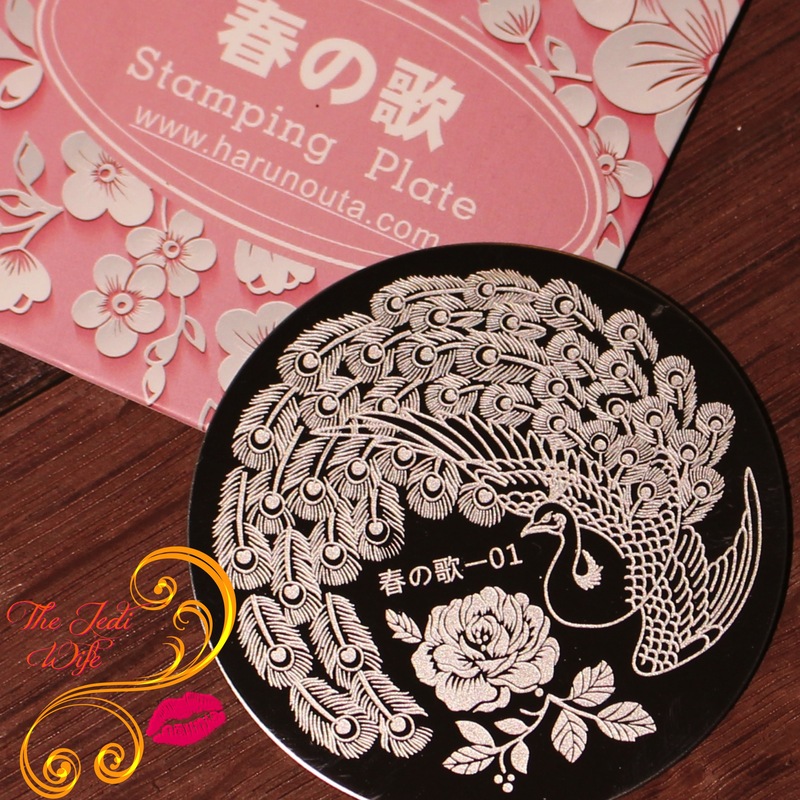 The peacock stamping plate with rose can be found here. As for my thoughts on this nail art look, it's not exactly what I had in mind when I first designed it, and the polish pen smearing was a huge letdown. That being said, I'm still glad I attempted a sugar skull look, and even more so because of using stencils that normally wouldn't make me think of skulls. That smearing was killing me and making me angry whenever I looked down at my hands so they had to go. I absolutely LOVED the rose pattern on my other nails so I opted to carry it across the rest of them. Check it out! I just love the look of the double stamping! It adds such a beautiful depth to the rose! But wait, there's more! I used a glossy top coat for 99.99999% of my manicures, but something told me to pull out my bottle of Girly Bits Cosmetics Polish Matte'rs. I'm SO glad I did! Check this out! Yeah, baby! 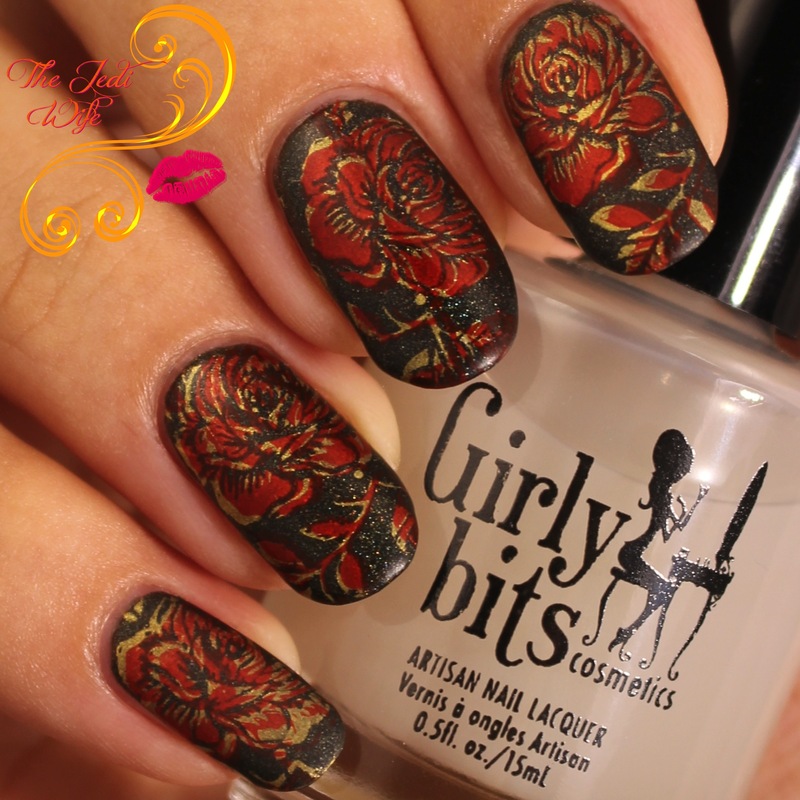 The matte top caot added a touch of an antiqued look to the design, and I especially loved how it muted the gold stamping polish from Girly Bits! While I was unsure even in the end about the sugar skull design I paired with roses earlier today, there is no doubt that I love the rose design! I'm so glad my peacock stamping plate came to the rescue! Ha! 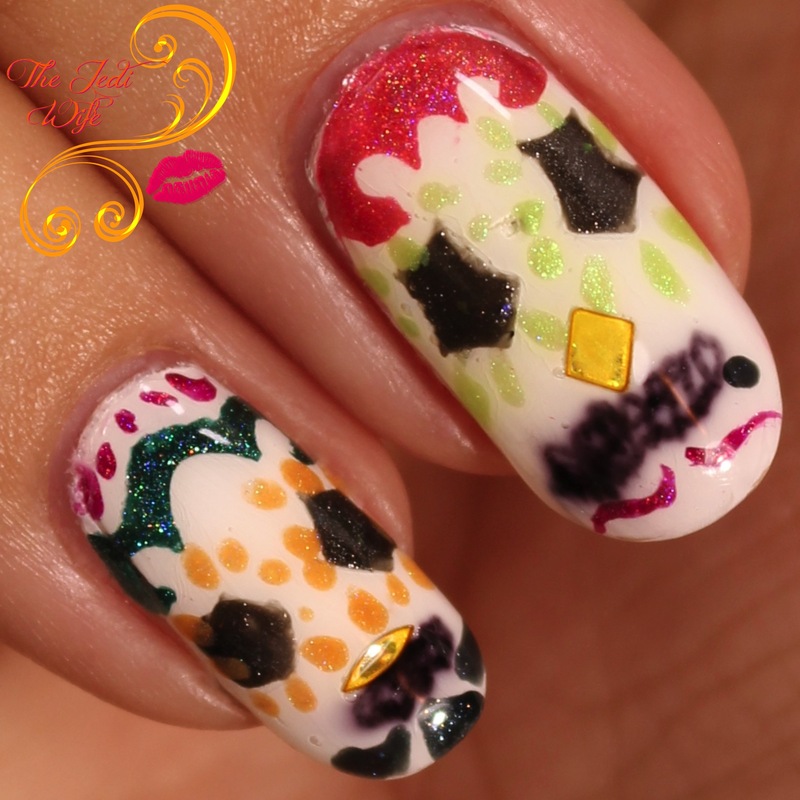 Be sure to check out Born Pretty Store for all your nail art needs! You can also save 10% off your full priced items with discount code QWL91. Those roses look absolutely gorgeous, and I love the sugar skulls! You worked your magic on those sugar skulls! 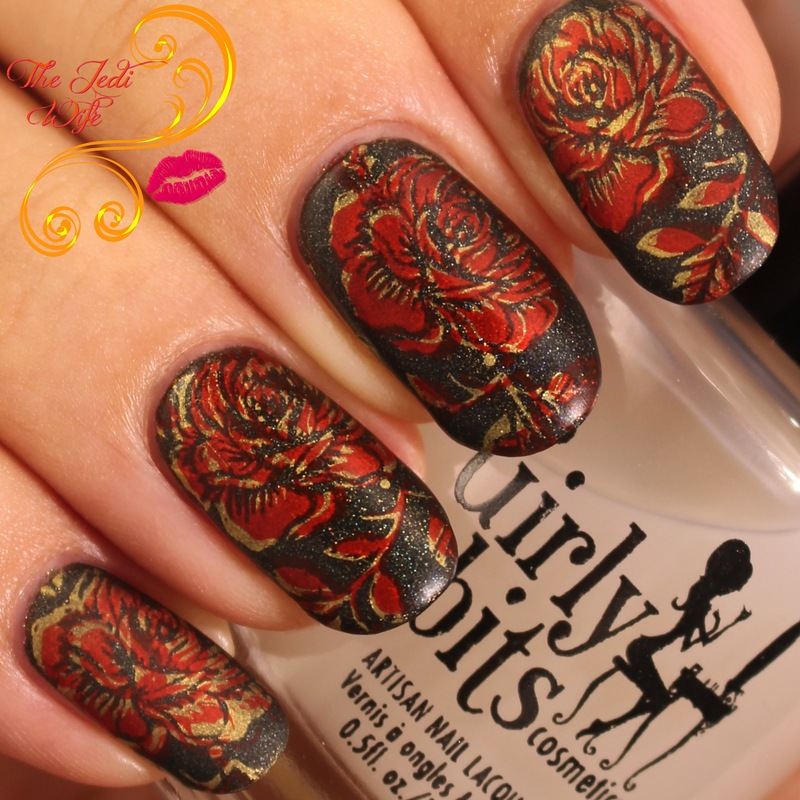 Normally I'm drawn to them, but your double stamping with the roses is absolutely flawless! Great manicure! And have fun this weekend! Can't wait to see your post on that! Those roses look so cool! 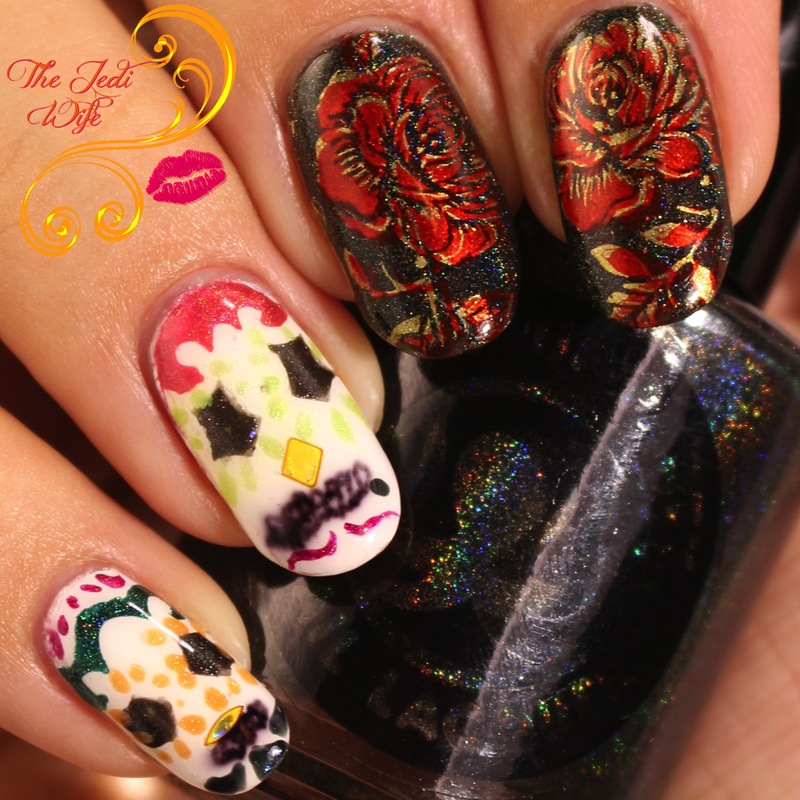 I love how creative you got with incorporating your vinyls to this mani by adding them to your sugar skull design! The colors picked for the sugar skulls are very lively. 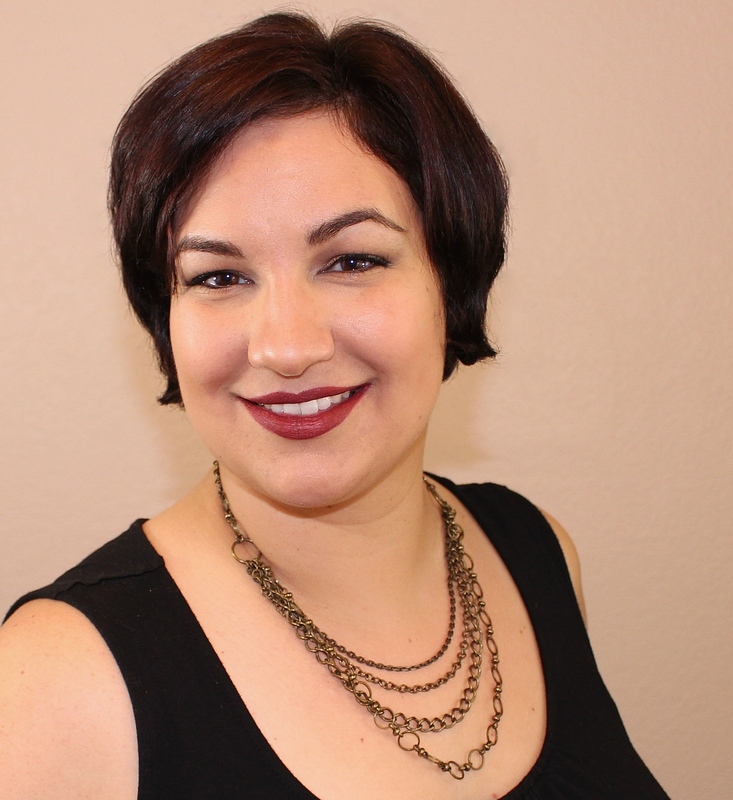 That being said, I also really like your full matte rose stamped look. the vinyls are lovely! I wouldnt want to use them. I totally overlooked the rose on that stamping plate until you pointed it out. I was so focused on that peacock that I completely missed it! 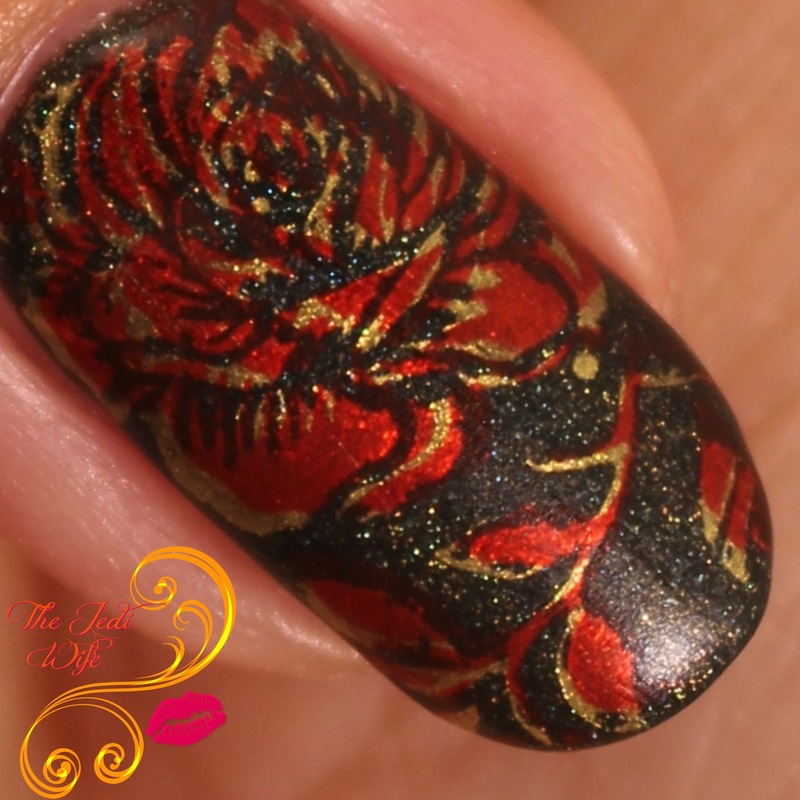 I love the double stamping of gold and red - it really gives an embossed look to the mani! You're double stamping is perfect! Love the mani! !and yeah matte was the way to go! Love! Fun look, totally love the roses especially! Pretty! I love the rose stamp. I love the double stamping, so pretty! This is so so soooooooo pretty! This is amazing! Too bad the skulls ended up blurring, but the roses saved the day. 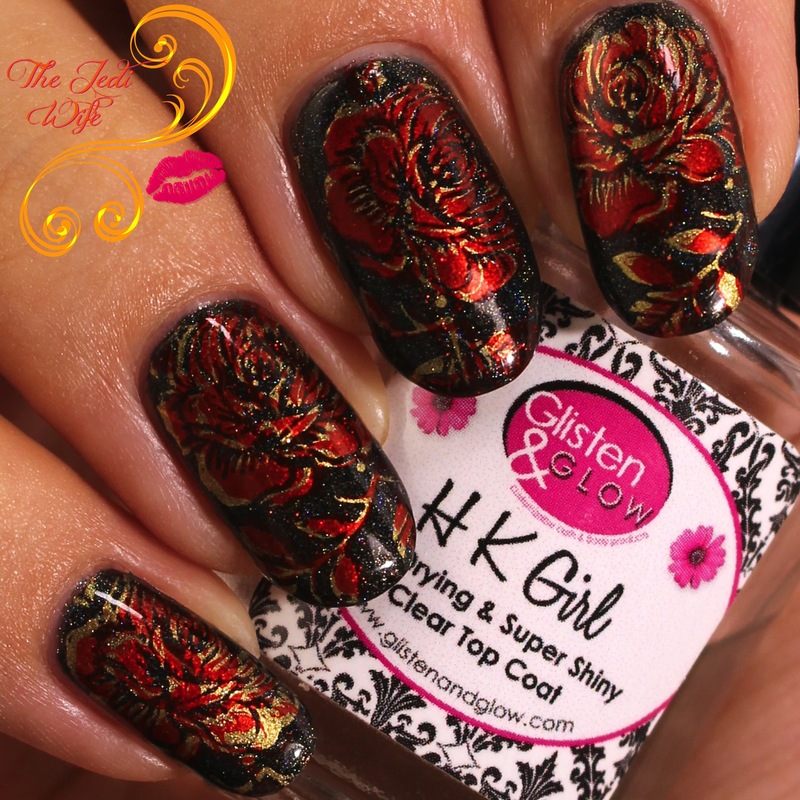 That double stamping in matte is fabulous! Love love love it! 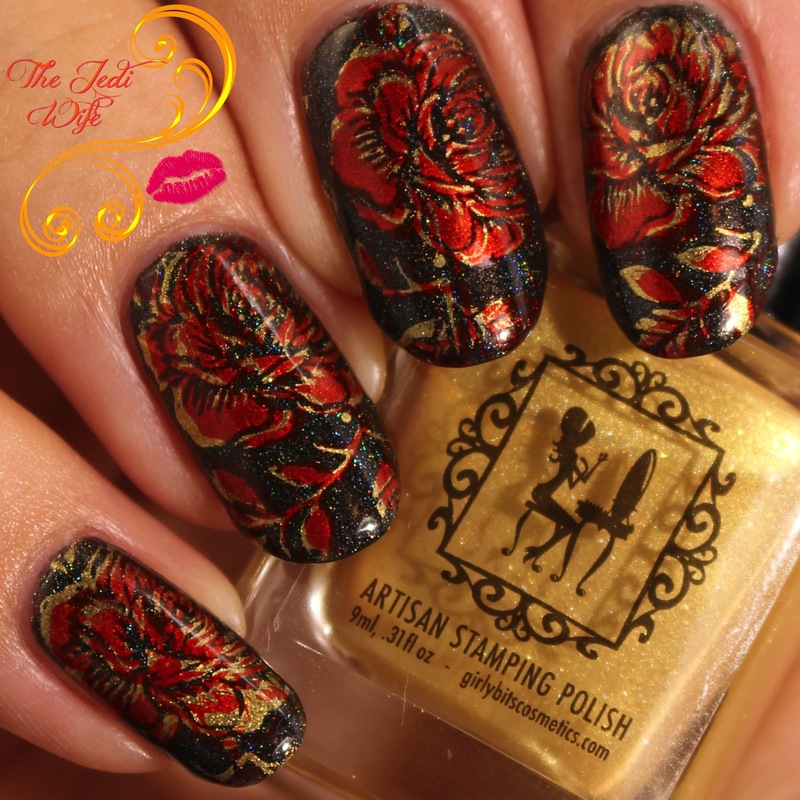 Wow you did amazing job with rose stamping !! Very pretty looks! 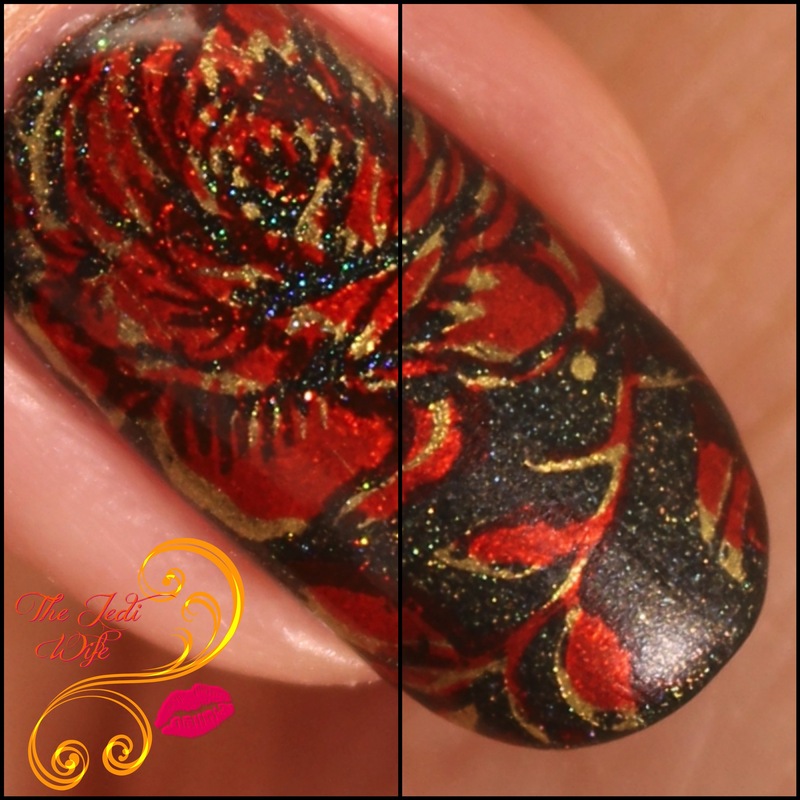 I love the red and gold roses! Those roses are just beautiful! It reminds me of the Japanese Maki-e technique! Super beautiful, I can't get over those roses! 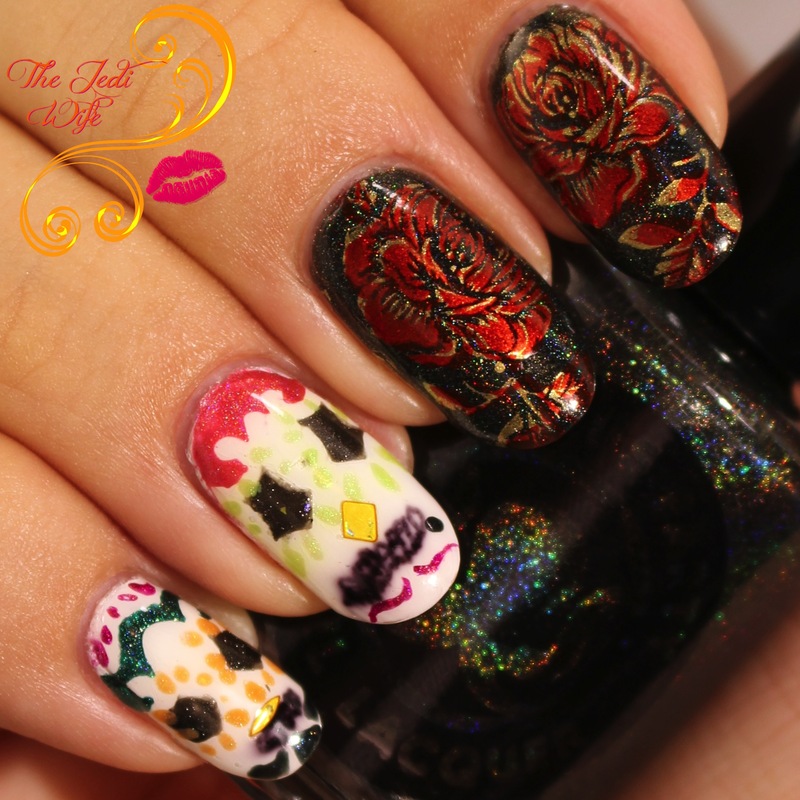 Floral manis are usually my favorites! 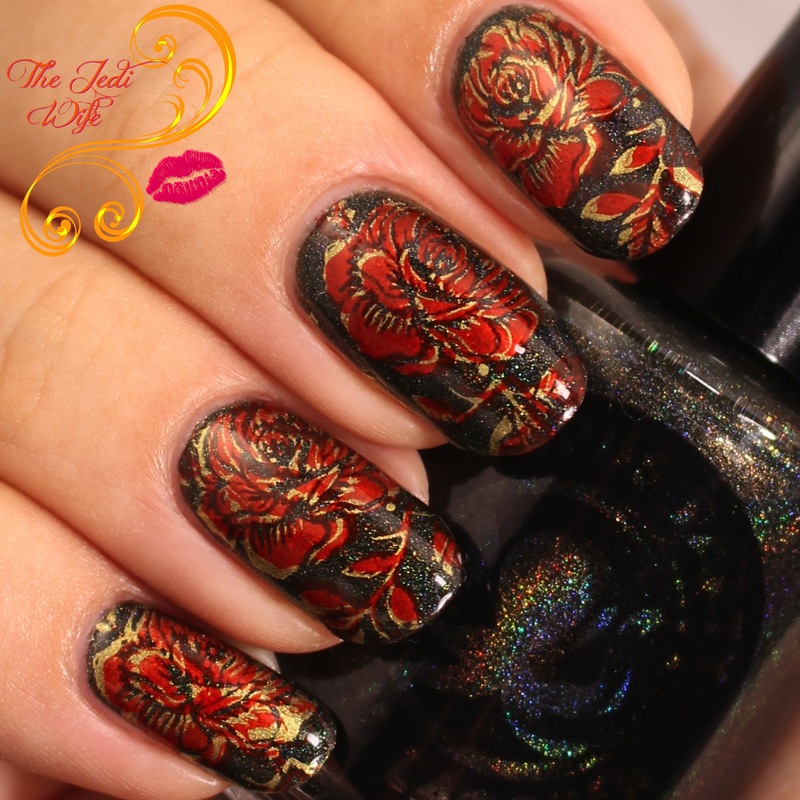 Your rose Mani is perfection! Those roses came out beautiful!